The Military Wife by Laura Trentham is an emotionally charged book that grabbed me from the get go. I couldn’t stop crying nor loving the main protagonists. Their troubles were intertwined in more ways than one. Grief and loss, has a way of connecting people together when they least expect it. 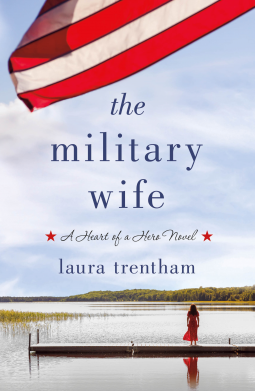 Laura Trentham showed readers what it meant and how difficult it was to be a military wife. It made me think of the women who journeyed to the wild west with their husbands hoping to make their future successful. Trouble followed those women and these featured here. Themes of sacrifice were not only seen but felt in this novel. Laura Trentham has a way of showing readers what life is like for those in the military and those married to military men. Hardships such as losing their husbands was a pain that pierced not only their hearts but mine too. It was like being there in person as they struggled to move forward.. Memories of loved ones brought both joy and sadness to those still living. Harper was a strong leading female character. Even though she was still suffering, she helped those around her who were suffering too. It takes more strength to do that. She was more than a likable character. And then there was Bennett. He too, has his own troubles. Burdens that weighed just as heavy if not more than Harper’s. Losing a fellow brother in the military is never easy. Overall, I highly recommend this heartfelt engaging tale of sacrifice and love to all readers. Thanks for reading!! Thrilled you enjoyed it!